The most powerful women in the world tell their stories in leadership. The young generation is pushing climate and energy solutions and new concepts like responsible finance. These trends have been discussed at the Global Female Leaders 2018. A review about great leadership stories, climate and energy challenges and the future of mobility. At the Global Female Leaders 2018 over 250 top-level executives gathered in the German capital in order to discuss four core topics. 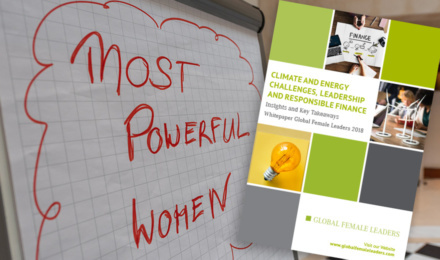 This second part of the review is about the two themes climate & energy challenges and leadership & responsible finance.